Using these hacks, you'll be able to make your kitchen sparkle in less time than ever before! Keeping your kitchen clean throughout the week is simple enough, even though it might not be your favorite chore. My two main goals for a “clean enough” kitchen are addressing the dishes and keeping the countertops clean. But every once in a while, your kitchen needs a more thorough cleaning. Cabinet doors, floors, and both your large and small appliances can get greasy and grimy over time, but cleaning them doesn’t have to take all day! In fact, some of those jobs can be downright simple if you know the best way to do them! So to help you in your efforts to deep clean your kitchen, I’ve put together a list of my favorite tips and tricks for cleaning just about everything in the kitchen. This list is the sum total of YEARS of trial and error with cleaning my own kitchen. But I consider all that effort to be well worth it if you can use it to make your own life a little bit easier! :-) Happy cleaning! Kitchen cabinets attract oil and grease like magnets, and it can be messy and time-consuming to wipe away all that nasty buildup. The absolute best way I’ve found to cut through the grease is using a combination of hydrogen peroxide and baking soda! Check out all the details at the link below. Speaking of greasy buildup, your kitchen floors can get equally as grimy as the cabinets! 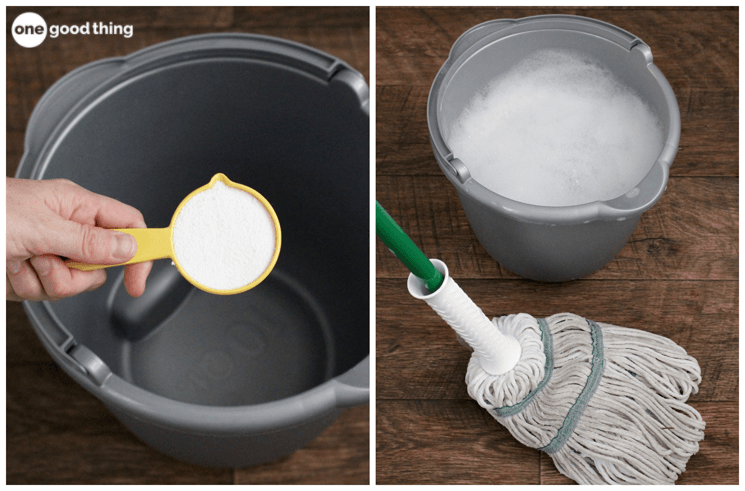 When your regular mopping solution just won’t cut it, give this formula a try. With only 3 simple ingredients, this easy solution makes it easy to clean even the greasiest floors! Cleaning your oven doesn’t have to involve back-breaking labor, or a self-cleaning cycle that makes your kitchen smell like the inside of a chimney. I found an easy way to loosen up the grime in your oven overnight, so it’s easy to wipe clean in the morning. Get all the details below! That unsightly burnt residue on your baking sheets may not be a huge issue, but it is annoying. I finally figured out a way to scrub the gunk away and return those cookie sheets to their former glory! Get all the details at the link below. Read More: Make Your Old Cookie Sheets Look Like New Again! The hood over your range/stove plays an important role in trapping cooking grease! But your range hood can only work effectively if it has a clean filter. If you haven’t cleaned your range hood filter recently (or ever, as the case may be), I highly recommend taking some time to do it! Get the simple instructions below. Granite countertops are beautiful and can last a lifetime, but they need to be properly cared for. Check out the link below to find the “recipe” for a simple and gentle granite cleaner that will make your countertops sparkle! Got oily splatters and messes around your stove and oven? You don’t have to spend hours scrubbing them! Just use the easy method outlined in the post as the link below. Those oily messes will be gone in a flash. It may sound strange, but your dishwasher needs to be cleaned too! Check out the post at the link below to learn how to do it in just 3 steps. This process clears food residues out of your dishwasher, which will help it work more effectively and efficiently. Spills happen when you’re cooking on your stovetop, and sometimes those spills make a mess of your burners and burner pans. Learn how to clean them at the link below. It is very important to regularly clean your electric kettle, especially if you live in an area with hard water, like I do! Limescale and other mineral deposits can build up inside affecting performance, and shortening lifespan. Luckily it’s an easy thing to do! A little vinegar & elbow grease are all you need to get it working like new. Microwaves tends to get very messy, especially when people who use it forget to cover the food they’re warming up! Here are TWO methods you can use to clean your microwave, with little to no effort, using the power of steam! That crusty white stuff that forms around your faucets, shower heads and toilet can seem impossible to get rid of. But not if you have the right stuff to do the job! All you need is a bottled of distilled vinegar, a clean rag, and a little patience. The vinegar does all the work for you, making your hard water deposits just a bad memory. We’ve all done it! Forgotten about something we’re cooking on the stove and the next thing we know our pan has a layer of burnt-on crud that looks like it’s NEVER coming off! Not so. There are many effective ways to return your pans to their original glory! I’ve shared 10 of them. Keeping white plastic cutting boards WHITE is an problem that plagued me for years until I tried this simple method using the power of lemons! Lemon juice contains a compound that increases sensitivity to light, and when combined with the power of sunshine, you can literally bleach stains away in hours without scrubbing! It’s easy to put off cleaning your refrigerator because it seems like such a daunting task. But it’s actually easier than you think if you have a few tips and tricks up your sleeve! This step-by-step method will make cleaning and organizing your fridge a pretty painless process and will result in a clean and tidy fridge you’ll be proud to open! Food residues can get stuck to the blades in your garbage disposal and cause all sorts of unpleasant smells. Keep your disposal fresh and clean by making easy vinegar cubes! The power of lemon and white vinegar helps clean and deodorize with little to no effort on your part! Get more details below. Your cast iron pans will serve you well for years to come if you care for them correctly! Learn the best way to clean and care for cast iron in my post below. You’ll never know how truly clean your stainless steel sink can be until you try cleaning it with Barkeepers Friend. The sparkling clean shine will amaze you! Do you have baked-on food in the outer lining of your slow cooker? You can scrub it away in just a few simple steps! And it’s easier than you’d think. The Instant Pot can be a bit intimidating, especially when it comes time to clean it! But it’s not as tricky as it seems, and it only takes a few minutes to do. Learn how to do a quick everyday cleaning after each use, and a deeper clean once a month to keep your Instant Pot looking and working like new. For the rest of your kitchen, check out these reusable disinfecting wipes! They’ll leave your kitchen clean and fresh, and you can wash and reuse them as many times as you want. They’re easy on your wallet and on the environment! These are great tips – many thanks for compiling together. I’m going to direct clients to your site as a comprehensive guide to helping them get their kitchens clean and ready for showing.